We went to Goldstream Provincial Park last weekend to check out the salmon run and the waterfalls (now that its rained a decent amount around here!). Goldstream Park is particularly noted for its 600 year old Douglas Fir and Western Red Cedar trees, the popular hike up Mount Finlayson and, of course, the annual salmon run in the autumn. First, we stopped briefly at Niagara Falls on Niagara Creek (though why it is named this I don’t know!) which was looking very nice after all the rain. Its much less impressive in the summertime during our usual drought. Then, we headed off to Goldstream Falls, a much less-visited and quieter area with a longer walk to access the falls. Along the way, I heard and then spotted a Pacific Wren among the brush. As we walked along the rushing creek amid the green trees, a spot of blue moved through the branches and landed on a mossy tree branch. A Belted Kingfisher – she remained still long enough to photograph; a rare occurrence for the birds I like to call hummingbirds of the sea (okay or lake or stream) because they move so fast. I’d hoped to see some Bald Eagles and other raptors (or even a bear!) at the riverside waiting to feast on salmon, but mostly it was gulls and ravens. At Goldstream Falls, a surprise awaited us. In the pool below the cascade were hundreds of salmon who made it to their destination! They reached the end of the road. Some of them were trying to leap up the waterfall and continue upstream but to no avail! I wonder if it is discouraging to them to know they are going to become nature’s buffet but I suppose they are unaware…Check out the jumping salmon on video at Goldstream Falls below. This summer, something very exciting that I will never forget happened… I finally saw my first whale. I say finally because I’ve been hoping to see one for a long time. I’ve been lucky enough to go on a few small vessel ocean cruises in New Zealand and I also went on a whale watch tour there, but I never saw a whale on any of those trips! Back in July, this all changed when I took a weekend trip up to Campbell River. The first day there, we decided to head over to Quadra Island for the day. Quadra Island is one of the Northern Gulf Islands which lie between Vancouver Island and the mainland of Canada and BC. Its a short ferry ride over from Campbell River across the Discovery Passage to Quadra Island. When we were about midway across the passage, all of a sudden off to our port side we saw it…a whale! We saw a small dorsal fin and a bit of body sticking up above the water. We watched for a few moments, fascinated, then it dove down and we saw the underside of its tail before the whale was submerged in the water once more. The underside of the tail had some white on the outer edges. There’s more to see than whales, too; Quadra Island and Campbell River are beautiful with wonderful views like this one below of the Coast Mountains of mainland BC. Quadra Island especially had some lovely birding spots and good opportunities for seeing shorebirds and lots of bald eagles in Campbell River. Another view east of the mainland of BC and the Coast Mountains from Campbell River. Mt Doogie Dowler is the distinct peak to the centre-left at 2076m. Looking at the calendar, its hard to believe it’s already August and it was four months ago now that I went on my big trip to the Canadian Rockies. Our trip to the Rockies was beautiful and energizing, inspiring and inviting. Despite loving the seaside life, there is really something special about the Rocky Mountains. Each time I’ve visited them, I have come away a little bit awestruck. And after being devastated by the death of my beloved cat Sidney, this trip re-invigorated something in me again. Not only did I see my very first grizzly bear in a lucky sighting that could not possibly have gone better, but I saw two grizzlies in one day! This is an experience I will never forget. Among glacial landscapes and turquoise lakes, waterfalls and canyons were more exciting wildlife sightings. I’ve recounted part of our final day in Jasper National Park – our second grizzly encounter. After seeing the second grizzly, we began to make our way back to town from Lac Beauvert when we saw a group of bighorn rams beside the Athabasca River. These were the first rams I’d seen on our trip thus far and their curved horns are incredibly impressive. Before this, I’d only seen ewes and juveniles all the way back in Radium Hot Springs, BC. Now that it is August, it will be rutting season and the rams will battle for mating rights in the autumn. I can only imagine that would be quite a sight to see with their large, powerful horns. But back in April, this pack of rams were living peacefully together. Not far away along the highway, we also saw elk (or wapiti) before the end of the night. We’d seen many elk around the mountains earlier but I hadn’t yet had a chance to stop and photograph them properly. So this time, we did. Elk are some of the most commonly observed animals in the park and also the most dangerous! Bull (male) elk will attack humans if approached too closely, especially during mating season. They are an important prey species for wolves, coyotes and cougars as well as the occasional black or grizzly bear. The other highlight of our trip was another big animal sighting…a moose. On our first day in Jasper, we headed out to hike Maligne Canyon and see Medicine Lake on the way. Amazingly, my partner spotted this moose across the river hidden in the brush while he was driving. Immediately, we turned around and headed back to get a closer look. Medicine Lake, Jasper NP. Medicine Lake is a geological wonder. The water is so low because it sits over a series of caves and sinkholes, into which the water drains before eventually coming out in the Maligne Canyon. Sure enough, just on the side of a river, in a most peaceful place surrounded by bare branches and tall conifer trees, there she was. A moose. It doesn’t get much more Canadian than this. A moose along a riverside in Jasper NP, AB. Maligne Canyon, where the hidden waters of Medicine Lake finally re-surface amid the limestone walls of the Palliser Formation. We watched her ever so quietly from afar while she ate, the rush of the river the only sound in our ears. Nearby, a squirrel scurried among the rocks and pebbles on the riverbank. But to me, all else was still and quiet and all that mattered was this moose, this huge, solitary herbivore alone in the woods. She reminded me of a giraffe the way her tongue wrapped around branches to eat. It’s probably silly, but being a vegetarian, I sometimes feel a little bit of extra love for my fellow herbivores. Despite my hopes, I never dreamed we would see a moose. This was, by far, one of my most memorable and cherished wildlife sightings in my entire life. I feel blessed to have been able to see her so peacefully in her natural habitat, wild and free, the very picture of Canadian wilderness. She was so beautiful. I will remember her forever. Observing all the animals we did on this trip was incredible. You can’t help but feel something stir in your spirit in a connection with nature watching animals like these and I feel so thankful to have gotten to see each and every one. While we are lucky to have been left our national parks thanks to the foresight of our forefathers and foremothers, do we still have that foresight today? Will we continue what was started by Teddy Roosevelt, John Muir and Ansel Adams even John D. Rockefeller, Jr. and respect their legacy? I hope so. Back in April, I went on a big trip to the Canadian Rockies for the first time. Looking at the calendar, its now July and somehow I’m still blogging about it. We decided to do a picnic dinner at Lake Annette that evening in celebration of our final night in the Rockies. Lake Annette is a lovely kettle lake formed by a remnant block of glacial ice which melted and formed a lake following glacial retreat. As we had not explored much of the eastern side of the Athabasca River valley yet, after eating, we went on a short tour of the area to complete our Jasper experience. At Lac Beauvert, we gazed into the crystal clear water reflecting the snow-capped mountaintops, the Fairmont Lodge perched on the edge of the lake in picturesque style as we reflected on our trip. We walked along the lakeside a short distance. Between swatting away mosquitoes, I gazed up and saw in the distance, between two trees, the great hulking brown shape of our second grizzly bear of the day. After the reactions of those we told about our first sighting, we thought we’d never see another, but here he was. Quietly grazing before us on the lush green golf course. He was big and beautiful. Feeling quite a bit braver after our first experience, but still respectful, we decided to walk just a little closer to watch. In the quiet evening, we watched the bear from afar, grazing the manicured golf course grass much like a black-tail deer back home on Vancouver Island. The perfectly manicured grass down in the warm valley must be incredibly irresistible after a winter spent hibernating. Watching this bear was beautiful and I felt lucky to be able to do so. Once, grizzlies were widespread across North America. Today, 20,000 remain in Canada, mostly in British Columbia. They are not the fierce carnivores they are often made out to be; only 15% of their diet is meat, which is often in the form of carcasses. The rest of their diet consists of berries and other plants (Parks Canada). Grizzlies (also known as brown bears) are an important part of the ecosystem and are an indicator of ecological health. They help disperse seeds throughout their habitat and when they dig in the dirt for food, they bring up nitrogen, too. Their return to areas in their previous range is wonderful news. Because habitat fragmentation is a serious threat to grizzly populations, the Yellowstone to Yukon (Y2Y) Conservation Initiative aims to preserve wildlife corridors in what remains of the pristine Rocky Mountains. Not only are they beautiful and fascinating creatures, but they also, like every other animal, have an important role in the ecosystem. While they are protected in Alberta and in national parks like Jasper, but park and provincial boundaries can only do so much. In BC, grizzly bear hunting is still, embarrassingly, legal. Even protecting grizzlies in Alberta can’t stop poachers. People’s attitudes toward grizzlies are mixed. I was afraid of encountering one until I actually did. Somehow facing it seemed to help. I prepared myself for the possibility by learning what to do if you encounter a grizzly and more about their behaviour. I think people are fearful of what they don’t understand or are not educated about, bears included. Only by educating ourselves about grizzly behaviour and survival needs can we learn to live in peace with them. Sign a petition to end grizzly hunting in B.C. Grizzly bear lucky to be in Jasper, AB where grizzly hunting is banned. Our first major stop on our Canadian Rockies trip was in Kootenay National Park in BC, on the western side of the Canadian Rockies following the Kootenay and Vermillion Rivers. This park is probably a lot less famous than its eastern cousin, Banff National Park because it features fewer amenities and day walks and more backcountry opportunities. The Vermillion River in Kootenay NP. While hiking to Marble Canyon, we looked up to see a Red-Tailed Hawk flying overhead. We took a short stop to see the emerald waters of Olive Lake where there is now a grizzly bear sow and her cubs foraging nearby, closing off the area. 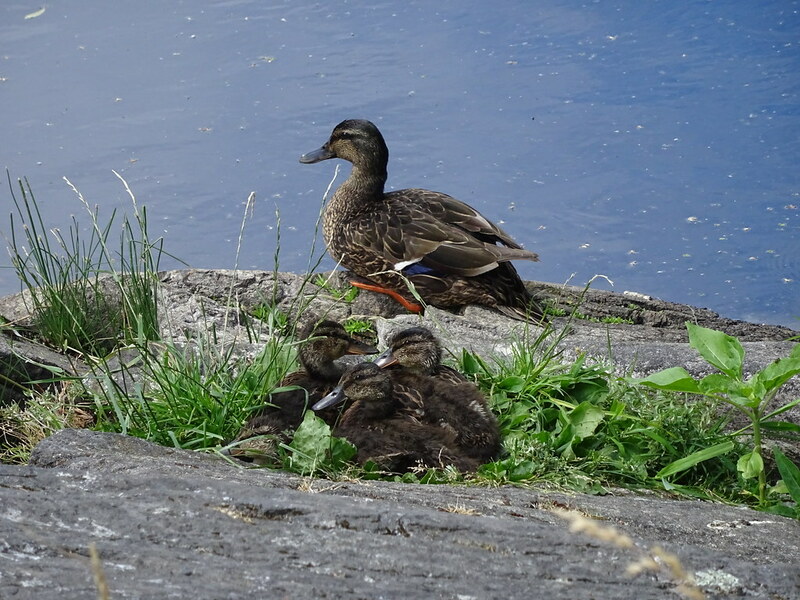 I can’t blame her; with the water nearby and lots of lush vegetation, its certainly great habitat for raising young. Walking along the lake, we heard varied thrush singing its buzzy song high up in the trees and saw a kingfisher dash among the trees on the edge of the lake. I was pleasantly surprised to see both species living here, having no experience birding in the Rockies before, I wasn’t sure what to expect. This was the first of many emerald and other brilliantly coloured lakes we’d get to enjoy on our journey! Olive Lake, Kootenay NP with patches of snow still clinging to the ground. Just outside the southern edge of Kootenay NP lies the town of Radium Hot Springs, renowned for its slightly radioactive hot springs. We did not visit the springs, but we did see the town’s resident bighorn sheep, which was an exciting surprise. They grazed on grass around the town much like our urban deer in Victoria. This was only the second time I’ve ever seen bighorns. When we travelled to the southwest USA, I kept reading about them and how elusive they were and how seeing one was rare. And yet, here they were walking around the middle of a town in BC! Bighorn sheep in Radium Hot Springs, BC. They haven’t always frequented the town, however. Bighorns typically migrate down to valley bottoms during the winter to escape deep snow and find reliable food sources. Their preferred habitats are grasslands and open forest and they require steep rocky terrain as escape routes from predators. Due to the prevention of forest fires in recent years, forests in the area are more dense and widespread. Forest fires are a natural phenomena and once provided much-needed grasslands to species like the bighorn sheep. The bighorn sheep learned that the town of Radium Hot Springs and the surrounding area provides perfect grazing opportunities and they now spend their winters there. However, there has been promising efforts underway to restore bighorn habitat in the park through prescribed fires. Bighorn sheep in Radium Hot Springs, BC. Just one example of how humans shape and influence the ecosystem with forest fire intervention. As we continued north, we climbed upward in elevation as well until we reached the Continental Divide and the boundaries between Kootenay and Banff National Parks. The Continental Divide is the boundary between drainage basins: here, between the Atlantic and Pacific Oceans which also happens to be the Alberta-British Columbia border. This was the first of many times we crossed the Continental Divide on our journey through the Rockies. After entering Alberta, we had more time to explore Banff National Park. The continental divide at the Kootenay/Banff NP boundaries, also the British Columbia/Alberta border.